From Robert D. Kaplan, named one of the worldÃ¢ÂÂs Top 100 Global Thinkers by Foreign Policy magazine, comes a penetrating look at the volatile region that will dominate the future of geopolitical conflict. Over the last decade, the center of world power has been quietly shifting from Europe to Asia. With oil reserves of several billion barrels, an estimated nine hundred trillion cubic feet of natural gas, and several centuriesÃ¢ÂÂ worth of competing territorial claims, the South China Sea in particular is a simmering pot of potential conflict. The underreported military buildup in the area where the Western Pacific meets the Indian Ocean means that it will likely be a hinge point for global war and peace for the foreseeable future. In AsiaÃ¢ÂÂs Cauldron, Robert D. Kaplan offers up a vivid snapshot of the nations surrounding the South China Sea, the conflicts brewing in the region at the dawn of the twenty-first century, and their implications for global peace and stability. One of the worldÃ¢ÂÂs most perceptive foreign policy experts, Kaplan interprets AmericaÃ¢ÂÂs interests in Asia in the context of an increasingly assertive China. He explains how the regionÃ¢ÂÂs unique geography fosters the growth of navies but also impedes aggression. And he draws a striking parallel between ChinaÃ¢ÂÂs quest for hegemony in the South China Sea and the United StatesÃ¢ÂÂ imperial adventure in the Caribbean more than a century ago. To understand the future of conflict in East Asia, Kaplan argues, one must understand the goals and motivations of its leaders and its people. Part travelogue, part geopolitical primer, AsiaÃ¢ÂÂs Cauldron takes us on a journey through the regionÃ¢ÂÂs boom cities and ramshackle slums: from Vietnam, where the superfueled capitalism of the erstwhile colonial capital, Saigon, inspires the geostrategic pretensions of the official seat of government in Hanoi, to Malaysia, where a unique mix of authoritarian Islam and Western-style consumerism creates quite possibly the ultimate postmodern society; and from Singapore, whose Ã¢ÂÂbenevolent autocracyÃ¢ÂÂ helped foster an economic miracle, to the Philippines, where a different brand of authoritarianism under Ferdinand Marcos led not to economic growth but to decades of corruption and crime. 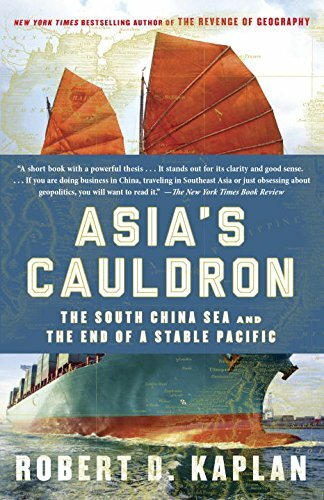 At a time when every dayÃ¢ÂÂs news seems to contain some new storyÃ¢ÂÂlarge or smallÃ¢ÂÂthat directly relates to conflicts over the South China Sea, AsiaÃ¢ÂÂs Cauldron is an indispensable guide to a corner of the globe that will affect all of our lives for years to come. About: NAMED ONE OF THE BEST BOOKS OF THE YEAR BY FINANCIAL TIMESFrom Robert D.
About: NAMED ONE OF THE BEST BOOKS OF THE YEAR BYÂ FINANCIAL TIMESFrom Robert D.
About: Over the last decade, the center of world power has been quietly shifting from Europe to Asia.